No show, late cancellaton two days prior arrival is charged for the amount of two night stay for the number of persons listed in the reservation. Comfortable and modern accommodation in a mediterranean island mbiance, above main Supetar beaches and promenade. Easy access from City of Split to Supetar port by ferry boat. Pickup upon arrival from the ferry port in Supetar only: 40,00 kn for up to 4 person. Throughout 2017. significant improvements have been made to bedrooms and bathrooms especially!! The room was nice and clean and the villa was cool, we met nice people and really enjoyed our stay there''. We shall be very happy to hear your review of Rooms Sunce which will help us further develop our Residence. My two friends and I had a lovely stay at this quiet & relaxing guesthouse/boutique hostel. It's excellent value for money, especially given peak season in Croatia. We were made to feel so welcome and couldn't fault a thing. Fans kept the rooms cool at night despite the heat. There are nice pebbly beaches really close by and the island itself is absolutely beautiful. Not to mention the incredible sunset views from the terrace :) Thank you and hope to be back someday! I had a really wonderful stay. It was super peaceful and restful which is exactly what I needed. The staff are lovely and very helpful. The views from the outdoor kitchen are incredible and it was a great place to watch everyone letting off flares and fireworks when Croatia won!!! Highly recommend. Amazing view, clean facilities and the manager is the loveliest lady you will meet. It was such a pleasure to stay at this hostel. The hoast is kind and welcoming. Any request was taken seriously and immediately resolved. The view from the kitchen terrase is just breathing. We have had fabulous time in Supetar. Lovely room with spectacular view from the terrace, peaceful and quiet with just a short walk to the centre. Host was very friendly and knowledgeable about the local area. She helped us with local transport to the olive oil museum in Skrip, which is well worth a visit if you have time. Fans were provided in the rooms, however it would probably benefit from air conditioning in the summer as it was very hot at night. Supetar is a great place to stay, would recommend. Nice place to stay, very quiet (I was about the only one here). They did upgrade me to a single room with a private bath, Overall, I enjoyed staying here. It is a ways out of the center of town, but the walk was good. 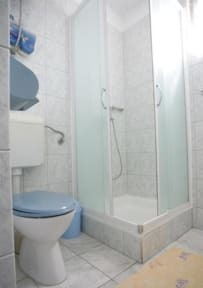 Friendly helpful staff, clean comfortable rooms in a small residential street not far from the main port in Supetar. Recommended. 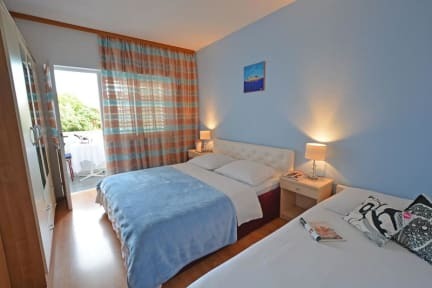 Staff were very friendly and accommodating, rooms well equipped and clean, and location a ten minute walk from the beach. No AC + blood thirsty mosquitos in the room were the biggest detractors for me, but overall a lovely stay! Rooms Sunce was a wonderful place to stay for a relaxing week. Nice and helpful staff. The staff is extremely friendly and welcoming. The cold juice they provide after the walk up the hill is much appeciated. Very quiet place, nice view and a nice stroll to town. Thank you!